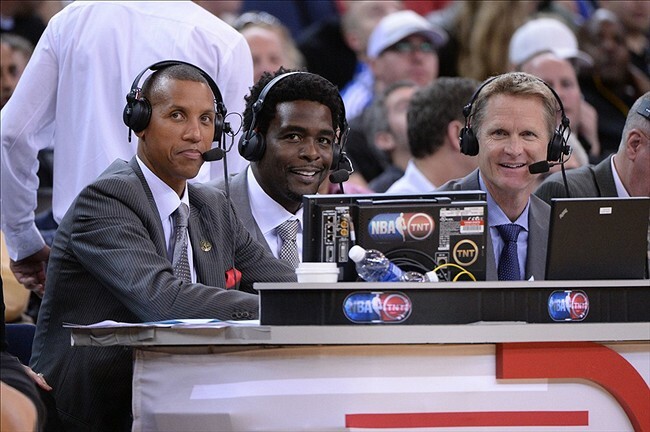 The two favorites have to be the men pictured about with Kerr (when they did a game in April 2013 sans a play-by-play guy), Reggie Miller and Chris Webber. Miller makes sense in terms of that he is already the analyst on the second broadcast team and joins the top team often including for the All-Star Game and for the conference finals. It would appear to be a seamless fit for Miller to slide into Kerr's position but there is only one big problem: Miller is awful. Anybody that follows me on Twitter knows that I am far, far from being a fan of Miller's work and quite frankly, I do not think that Miller is all that problem with the fans. However, he clearly has his fans at Turner considering they employ him. Webber is the other top contender and ever since he joined Turner after retiring in 2008, he has been a bit of a utility man. He appears often on NBA TV as an analyst for Gametime Live and Fan Night, often fills in on Inside the NBA, and also does a good number of games including playoff action where this year he was paired with Joel Meyers and Ian Eagle. I have always been a fan of Webber in both the studio (where he should have been the fourth studio guy instead of Shaquille O'Neal) and in the booth and I think he would be a better fit as the top analyst over Miller. Now onto some dark horses. Greg Anthony joined NBA TV a few years ago and was seen on a number of TNT games as well as playoff telecasts with Brian Anderson. Considering he is the top analyst for CBS and Turner's coverage of March Madness, along with Kerr, could he also become TNT's lead analyst? Seems like a stretch, but I would not rule it out. Charles Barkley could ultimately become the biggest wild card in this mix. I highly doubt that TNT would want to move him off Inside full-time considering he is a key star of the show, but he has said often that he is pondering leaving TNT at the end of his contract because of how long he has done Inside and how he does not want to feel stagnant. That is why you have seen him on more games. Barkley did five telecasts this season, three a year ago and one before that. I would be surprised but I bet the TNT honchos are at least pondering putting their biggest star on their top crew. One candidate you can cross off is Mark Jackson, the man who Kerr replaced in Oakland, as he has already signed a deal with ESPN and dove right in for their coverage of the Eastern Conference Finals. Maybe somebody will come in out of nowhere and get the job but in my opinion, it will come down to Miller and Webber and while I hate to say this, I think Miller could have a slight edge. But wouldn't I hope to be wrong about that. But a quick note about Kerr and his work during the NCAA Tournament. It does not appear that he will be replaced on the Final Four, leaving Jim Nantz and Anthony to work at a two man crew. Albert's partner during March Madness in all likelihood would be his new TNT partner. 1. marv albert/mike brown. 2.kevin Harlan/reggie. miller 3.brian Anderson/greg Anthony.